Madrid is, without any doubts, home of one of the most beautiful parks of Europe; El Parque del Buen Retiro. But not everybody knows that almost every neighborhood in the city has its own park, square or community garden. And, since spring is coming, what better subject to talk about on our April Blog than the best parks in Madrid? Keep on reading if you want to know more! Considered the “lung” of Madrid, this park is a must see on your trip to the capital. It is not only a huge park but also an experience within the city, a mandatory stop on a sunny afternoon and a relaxing place where one can hang out and rest. It even has a Rose Garden with more than 4.000 roses that bloom in May and June and for some more romance visit its artificial lake where you can rent little rowing boats. Another reason to visit this magical park is the Glass Palace, a pavilion created to host a collection of exotic plants for the Philippines Exhibition of 1887. It is open for the public every day of the year. This park in the El Capricho area was an idea of the Duchess María Josefa de la Soledad Alonso Pimentel, back in 1784. The Duchess wanted to create a natural paradise visited by the highest personalities of the time, such as bullfighters and artists, and for a while this was where all the important people of the city got together. The most interesting thing about this park is the secret bunker. It is, as a matter of fact, the only example in Europe of bunkers from the Spanish Civil War. If you are curious to visit this fascinating underground structure, you can do so on weekend mornings only, but we are sure it is worth your while! 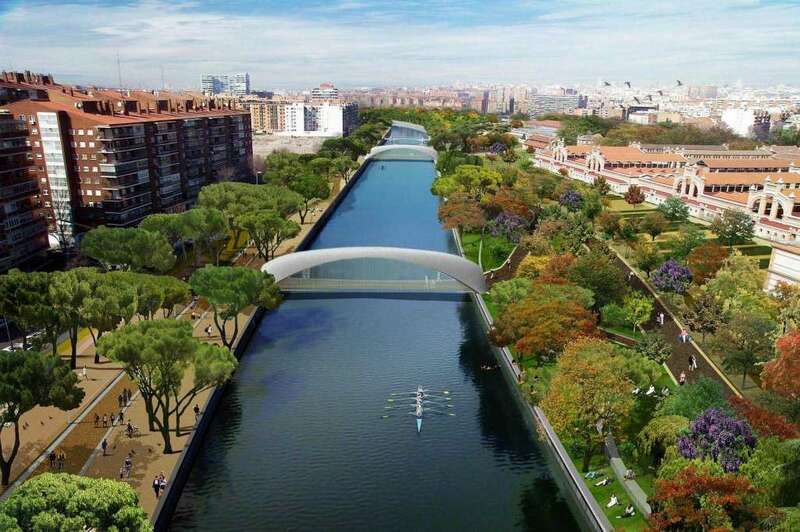 Madrid might not have a famous big river such as in London or Paris but it does have an amazing green area next to its levees. Right on the sides of the Manzanares (this is the name of our river) there are 17 play areas and all sorts of other fun, such as swings, hammocks, and climbing ropes, all made from sustainable materials. Cultural activities, such as exhibitions, live music and theatre, also take place along the river. Just few minutes away from Mad4You Hostel, one can find this magnificent spot that was designed by Manuel Herrero Palacios in 1968. Why? Well, he wanted to create a place where people can sit and enjoy, not only a breathtaking view of the city, but also the magnificent Egyptian Temple donated to Spain by Egypt. We assure you that the best sunset of Madrid is seen from here. Seeing is believing! These two are the gardens in front- and behind the spectacular Royal Palace of Madrid. The Sabatini Gardens are a beautiful extension of the Palace, situated on its north side, where the royal stables used to be installed before it transformed into gardens. The Campo del Moro Gardens were designed to imitate the surrounding of the Palace of Versailles and its centerpiece is the elegant Fuente de las Conchas (Fountain of the Shells). 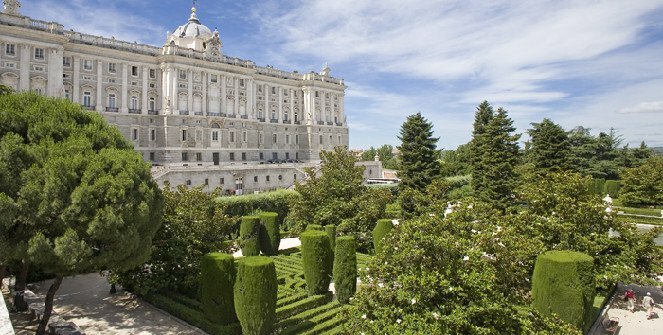 As it is positioned behind the Royal Palace, most visitors miss out on one of the best gardens of the city, which makes it the perfect spot to escape the tourist crowds and enjoy a hidden side of Madrid. Located nearby the Prado Museum, the Royal Botanic Gardens host thousands of species of live plants, an herbarium and a library. The gardens have three terraces: Terraza de los Cuadros (collections of all sort of plants from ornamental to medicinal), Terraza de las Escuelas Botanicas (plants gathered around 12 fountains) and the Terraza del Plano de la Flor (collections of trees and shrubs, landscaped in the Romantic English Style). Even if the entrance is not free (in order to maintain a high standard of maintenance) it is still worth a visit, also because it hosts a highly amount of exhibitions and activities. It is the perfect place for a cultural afternoon immersed in the green! The Garden is open to the public every day of the year, except for Christmas and New Year. This massive natural space was declared “Royal Forest” and was the royal hunting estate, under Fernando VI, for its country-like atmosphere. Nowadays there are many facilities inside of the park, such as a Zoo, the Aerial tramway (Teleferico), and an amusement park. Although it is not as popular as the Retiro Park, it is pretty common for most families to spend the day here, do sports (from kayaking to bike trails) attend concerts and generally enjoy this huge natural area which is 6.5 times bigger than Hyde park in London! If you feel like spending the day like a true Madrilenian, spotting animals or just doing some outdoor activities right in the city, then plan a day at Casa de Campo during your next trip to Madrid! Open for pedestrians all year round. Closed to private traffic. So, spring is in the air: birds are chirping, flowers are blooming and Madrid is waiting for you! Do not forget to make your reservation at Mad4You Hostel. High season is right next door. For any questions or general information you can contact us at info@mad4youhostel.com. We hope to see you soon to enjoy this beautiful time of the year together!